Herb Rich Tea - Rescues Wounded Skin - IngredientsRescues Health & Wellness Tea is formulated to naturally restore, renew, and repair the body as it recovers during stress-filled experiences. This unique blend of organic herbs can be infused and applied topically as a facial bath or you can drink the infusion as a supportive health & wellness beverage. Rescues Tea is also a healthy approach to supporting the body during the restorative months of Late Summer when the skin and body is in a reparative phase. Herb Rich Serum - Rescues Wounded Skin - IngredientsRescues Herb Rich Serum repairs and renews skin health that been altered due to age, over exposure to the environment, injury, skin cancer, surgery, or neglect. This exceptional fusion of seed oils and essential nutrients allows tired, lethargic skin to recover with a vibrancy of health, enhanced function, and appearance. Herb Rich Mist - Rescues Wounded Skin - IngredientsRescues Herb Rich Mist renews, restores, and repairs damaged skin, while improving dermal texture. In addition, the skin will experience an increase in normal cell function, which will promote a uniform distribution to melanin, enhanced lymphatic support, and will impeded cellular damaged caused from oxidative stress. Herb Rich Clay - Rescues Wounded Skin - IngredientsRescues Herb Rich Clay significantly renews, restores, and repairs skin affected by the environment, age, or neglect. This exceptional herbal formula improves skin pigmentation and tone while allowing skin to recover and return to a stable vibrancy. The effects of Mineral Rich Salts on the skin are profound. The soothing waters made from the Dead Sea and Himalayan salts hydrate, detoxify and soften skin texture. The high magnesium and bromide content in Dead Sea Salt is beneficial as an anti-allergen due to its cleansing and detoxifying properties in addition to gently removing harmful environmental particles from your skin. 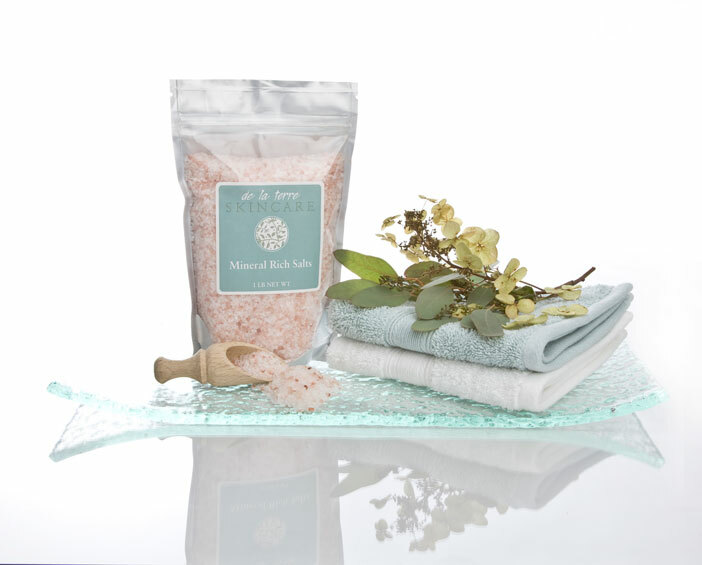 Himalayan Salts contain several rare therapeutic elements, which are present only in trace amounts in nature. These natural elements replenish fluids and electrolytes, thus leaving the skin well hydrated. Dissolve 1 Tbsp. Mineral Rich Salt with 8oz. heated water in a De La Terre Skincare LOVE - PEACE - JOY glassware bowl. Once salt water has cooled cleanse skin by compressing salt water into skin with soft cloth. Dissolve 1 Tsp. Mineral Rich Salt in a Neti pot. Use for nasal irrigation. By cleansing with the mineral salt water you free the nasal passage of harmful bacteria and toxins. For a soothing tub soak, dissolve 1 cup of salt in bath water. Soak for 20 minutes. Amazonite is used in skin treatments to stimulate cell regeneration and aid tissue after trauma or injury. It is beneficial for skin that is over stressed, and is extremely cooling to the skin. Amazonite helps establish harmony among self and others. It is the truth-teller and peacemaker, assisting in communicating one's thoughts and feelings without being overly emotional. It also helps one to set boundaries. Zebradorite is a balancing mineral compound. Perfect for promoting skin function to return to homeostasis. Zebradorite also provides a regulatory effect to the bodies nervous system. Grounding, calming, and supportive! Used for oxygenation of the skin. Reduces bruising and revitalizes starved skin. Calming to emotions reduces stress and provides a more empowered positive outlook. Kyanite is used in skin treatments to repair tissue after trauma. It also helps to shift one's perception and outlook. Amethyst is used in skin treatment to assimilate oxygen to cells and release toxic gases. Amethyst stimulates the immune system and calms nerves. It assists with emotional patterns that create imbalances. Place under your pillow at night for a peaceful night's sleep. Orange Calcite is used as a skin treatment to balance energetic meridians within the skin, thus bringing balance to all skin functions. Orange Calcite is great to use when applying acupressure. Orange Calcite is wonderful for creativity, playfulness, confidence and innovation. Aqua marine is a cooling stone and is used as an effective anti-inflammatory for heated or inflamed skins. Aqua marine aids in healing eczema, rosacea and psoriasis. Can also help with herpes breakouts and allergy symptoms. This stone is known to calm anger, release perpetuating negative thoughts and is useful for moving through grief. Sodalite is used for hydrating skin cells and water retention or swelling. Sodalite cultivates detachment from concerns and worries of everyday life. It reduces stress and anxiety by allowing one’s perception to be viewed from a higher place. The statements and claims made on this website regarding De La Terre Skincare are not intended to diagnose, treat, cure or prevent disease.